The Apache web server is an extremely stable and secure piece of software. With Apache powering close to 70 percent of the web sites on the Internet today, it has been well tested. It has become clear over the last decade that no software is 100% secure. Fortunately, there are several simple steps you can take to make your Apache installation more secure. The single biggest cause of security breaches is software that was out of date. As bugs and exploits are found in the Apache web server, patches are released to correct them. The single biggest step you can take to securing your Apache server is to install the patches or upgrade to the latest release of Apache. However, .htaccess can also create other security problems. Depending on what options are enabled in Apache, .htaccess can override a number of Apache’s configuration settings. or change 444 permission to the configuration files. pgrep looks through the currently running processes and lists the process IDs which matches the selection criteria. This will list all PIDs associated with the ssh process. This will execute the last command you used on the command line. This will execute the last command used on the command line that started with s.
watch runs command repeatedly, This allows you to watch the program output change over time. By default, the program is run every 2 seconds. watch is very similar to tail. This will watch the current directory for any file changes and highlight the change when it occurs. If you’re in a hurry, you can save and quit the file you’re editing in vi by exiting insert mode, holding shift, and hitting z twice. mkdir -p /home/adam/make/all/of/these/directories/ will create all directories as needed even if they do not exist. delete the entire line in teminal by using: CTRL+U. touch -c -t 0801010800 .c will show the time stamp as 2008-01-01 8:00. The format is (YYMMDDhhmm). Screen is a full-screen window manager for the terminal mode. It is best known for multiplexing a single terminal across several processes. By using it, you can run many number of commands within a single terminal. 2) Screen starts and creates a new single window with a shell. New windows can be created within the same terminal using the screen command. In screen, each window is given a unique identifier. The first window is numbered 0, the next window is 1 and so on. Now to switch between your 'top' and the ping, you can use the key 'Ctr+a 0' and 'Ctrl+a 1' respectively. This will allow you to select a rectangle using your mouse. The moment you let go of your left mouse button, a screenshot with the contents of that rectangle will be saved in the current directory. To check the gmail,u can access ur gmail inbox from command prompt. It will display used and free memory every two seconds. this will show you what happens in first console. to check other consoles /dev/vcs1 or vcs2 or vcs3. Man pages(short for manual pages)are the documentation that comes preinstalled with almost all Unix and Unix-like operating systems. The linux command used to display them is man. Each page is a self-contained document. The following section numbers of the manual followed by the types of pages they contain. Query caching is a way to increase the mysql performance by caching database queries. awk = "Aho Weinberger and Kernighan"
This language was named by its authors, Al Aho, Peter Weinberger and Brian Kernighan. The cat command is a standard Unix program used to concatenate and display files. The name is from catenate, a synonym of concatenate. grep = "Global Regular Expression Print"
grep comes from the ed command to print all lines matching a certain pattern g/re/p where re is a regular expression. fgrep searches for fixed strings only. The "f" does not stand for "fast" - in fact, "fgrep foobar *.c" is usually slower than "egrep foobar *.c"
troff = "Typesetter new ROFF"
From plumbing terminology for a T-shaped pipe splitter. Perl = "Practical Extraction and Report Language"
Perl = "Pathologically Eclectic Rubbish Lister"
The Perl language is Larry Wall's highly popular freely-available completely portable text, process, and file manipulation tool that bridges the gap between shell and C programming. In your /etc/fstab file, you have have seen an entry that looks UUID=c81355eb-96d2-458a-8ce0-3fa12a04cb8e instead of a more familiar disk drive designation, such as /dev/hda1. Such entries are called universally unique identifiers (UUID). You can use these 128-bit numbers to make hard disk management easier. This following command is used to print the UUID for a device. This may be used with UUID= in /etc/fstab to name devices that works even if disks are added and removed. redhat uses this in /etc/fstab file. The uptime command can be used to check how long the server has been running. The command iostat report CPU statistics and input/output statistics for devices, partitions and network filesystems (NFS). ss command is used to dump socket statistics. It allows showing information similar to netstat. The iptraf command is interactive colorful IP LAN monitor. It is an ncurses-based IP LAN monitor that generates various network statistics including TCP info, UDP counts, ICMP and OSPF information, Ethernet load info, node stats, IP checksum errors, and others. The tcpdump is simple command that dump traffic on a network. However, you need good understanding of TCP/IP protocol to utilize this tool. For.e.g to display traffic info about DNS. chkrootkit (Check Rootkit) is a common Unix-based program intended to help system administrators check their system for known rootkits. It is a shell script using common UNIX/Linux tools like the strings. 1. It checks for signs of rootkits - chkrootkit, ifpromisc.c, chklastlog.c, chkwtmp.c, check_wtmpx.c, chkproc.c, chkdirs.c, strings.c, chkutmp.c; chkrootkit is the main module which controls all other modules. 2.chkrootkit checks system binaries for modifications. eg: find, grep, cron, crontab, echo, env, su, ifconfig, init, sendmail ...). 3.Next, it finds default files and directories of many rootkits (sniffer's logs, HiDrootkit's default dir, tOrn's default files and dirs...). 4.After that, it continues to look for default files and directories of known rootkits. If it says "Checking `bindshell'... INFECTED (PORTS: 465)"
aliens asp bindshell lkm rexedcs sniffer wted w55808 scalper slapper z2 amd basename biff chfn chsh cron date du dirname echo egrep env find fingerd gpm grep hdparm su ifconfig inetd inetdconf init identd killall ldsopreload login ls lsof mail mingetty netstat named passwd pidof pop2 pop3 ps pstree rpcinfo rlogind rshd slogin sendmail sshd syslogd tar tcpd tcpdump top telnetd timed traceroute vdir w write. Clam Antivirus (ClamAV) is a free, cross-platform antivirus software tool-kit able to detect many types of malicious software, including viruses.There is a common talk that there are no viruses on the Linux platform - which to a large extent is true. But when you get a mail attachment from windows machine may be the machine is full of virus. That virus no affect our linux server.But it will affect the windows users whom using our websites. Once after installation you need to modify two configuration files to get ClamAV running & for definition updates. To find file fragmentation information for a specific file,we can use filefrag command. filefrag reports on how badly fragmented a particular file. It makes allowances for indirect blocks for ext2 and ext3 filesystems, but can be used on files for any filesystem. The ext2 (second extended file system) is a file system for the Linux kernel. It was initially designed by Remy Card as a replacement for the extended file system (ext).It was introduced with the 1.0 kernel in 1993.Ext2 is flexible,can handle file system up to 4 TB,and supports long file names up to 1012 characters,it has sparse super blocks feature which increase file system performance.In case any user processes fill up a file system,ext2 normally reserves about 5% of disk blocks for exclusive use by root so that root can easily recover from that situation. The ext3 (third extended file system) is a journal ed file system that is commonly used by the Linux kernel. It is the default file system for many popular Linux distributions,Stephen Tweedie developed ext3.It provides all the features of ext2,and also features journaling and backward compatibility with ext2.The backward compatibility enables you to still run kernels that are only ext2-aware with ext3 partitions.we can also use all of the ext2 file system tuning,repair and recovery tools with ext3 also you can upgrade an ext2 file system to an ext3 file system without losing any of your data. Ext3’s journaling feature speeds up the amount of time ,in ext2 when a file system is uncleanly mounted ,the whole file system must be checked.This takes a long time on large file systems.On an ext3 system ,the system keeps a record of uncommitted file transactions and applies only those transactions when the system is brought back up.So a complete system check is not required and the system will come back up much faster. The ext4 (fourth extended file system) is a journaling file system for Linux,Ext4 is part of the Linux 2.6.28 kernel,Ext4 is the evolution of the most used Linux file system, Ext3. In many ways, Ext4 is a deeper improvement over Ext3 than Ext3 was over Ext2. Ext3 was mostly about adding journaling to Ext2, but Ext4 modifies important data structures of the file system such as the ones destined to store the file data. The result is a filesystem with an improved design, better performance, reliability and features.developed by Mingming Cao,Andreas Dilger,Alex Zhuravlev,Dave Kleikamp,Theodore Ts'o, Eric Sandeen,Sam Naghshineh and others. The following command monitor u file change,like process and CPU usage on top command. d => (differences) Highlight changes between iterations. n => (interval) Run the command every seconds. df => report file system disk space usage. T => print file system type. h => print sizes in human readable format. ls => list directory contents. F => (classify)append indicator (one of */=>@|) to entries. l => a long listing format. A => do not list implied. t => sort by modification time. It will update files are getting written on our file system.It highlights if a file get modified,and you will know what your granted SSH access users exactly modifying. You can setup kernel variable to drop all ping packets. This instructs the kernel to simply ignore all ping requests (ICMP type 0 messages). Open system Interconnection-Created by ISO(International Organization for Standardization) in 1970 . * OSI layer helps to communicate two different vendor network devices using common set of rules. *That rules are very difficult to understand vendors.So that rules are separate seven groups,each group called layers. In this method is called layered approach model. 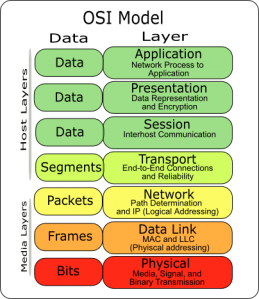 * Types of Seven Layers: Application,Presentation,Session,Transport,Network,Data link,Physical. * First three top layers(Application,Presentation and Session) managed application process(host layers) and bottom four layers(Transport,Network,Data link,Physical) are manged communication process(media layers). * Application layer provides interface between user and that particular application. * Application layer responsible for establishing and identifying intended communication partner(User). *Application layer choose actual application (using port no) and give to next layer using protocol stack. * Application layer acting to network related applications and also desktop related applications. * In my system,i removed my NIC card and TCP/IP settings,network drivers.At a time open my Internet explore the html web page document opened and retrieve HTTP protocol and getting some error message.In these case user opened html page and using http protocol and create Application layer PDU (Protocol data unit)and give to next layer using via port no(HTTP port no-80).And also added Presentation and Session layer PDU's finally comes to network layer finding source and destination ip address,But system don't have NIC card so encapsulation failed and lost the data finally getting some error message.In this cause user connected to application and getting replay message. * Presentation layer responsible present the data and data translation and code formatting for Application layer entities(Application layer PDU). *Presentation layer also responsible for data compression,decompression and data encryption,decryption. *Presentation layer responsible for general format to ASCII format.It means sender data to translate to any format and then re translate to that format in destination system. *Transport layer responsible for setting up (connecting)and managing and tear down (disconnect)session between presentation layer entities. *Transport layer dialog control (end to end connection control)between two devices or end to end nodes and also organize the server to client or between two nodes using different modes. Full duplex-In this method at the same time communicate sender and receiver. * And the main work for session layer different application data keeps and communicate to that exact that application for destination. * Transport layer responsible create segments(break the big data to small small segments) for session layer data entries and reassemble the segments to data and give to session layer. *Transport layer gives End to End Transport services and create logical connection between sending host to receiving host. *Transport layer works with TCP and UDP protocols. Description: rsync utility is used to synchronize the files and directories from one location to another in an effective way. Backup location could be on local server or on remote server. (*).One of the main feature of rsync is that it transfers only the changed block to the destination, instead of sending the whole file. -z, --compress - Compress file data during the transfer. -u - Do Not Overwrite the Modified Files at the Destination [if the file in the destination in modified and if u use -u option in rsync, the modified file wont be overwritten]. --rsh=COMMAND -- specify the remote shell to use. (e.g) --rsh='ssh -p1055' to login to remote system. --delete - This tells rsync to delete extraneous files from the receiving side (ones that aren’t on the sending side), but only for the directories that are being synchronized. ===>doc is the folder we copied. ===> --progress option gives you a progress meter of data send to the destination. ===> --stats option tells you a status information of file transfered. ===> --delete command is used to delete files in the destination if the source doesn't have the file. 6.rsync command with --exclude option. 7.rsync command to transfer file from Source system to Destination system. ===> The above command is used to copy file from source system to Desktop of destination system . 8.rsync command to transfer file from destination system to source system. #rsync -avz --progress --stats --rsh='ssh -Xp36985' rajm@192.168.1.5:Desktop/doc . ===> The above command is used to copy files from Desktop system to source of destination system . Sed stands for stream editor. A stream editor performs the text transformation from input stream and the input stream may be a file or input from a pipeline. . . .Sed command to print lines. . .
==> 1p which tells that print the first line and show the remaining lines. so we can see from the output hi is priented twice. ===> -n options is nothing but noprint, (i.e) It prints only the first line and didn't show the other lines. ===> The above command is used to print only a certain range of lines. ===> The above command displays only the last line. The '$' symbol indicated the last line and '-n'is used for no print and it combines with option 'p' to displays only the last line . . . .Sed Command to delete lines. . .
===> The above command used to delete only the fisrt line and display the remaining lines. ===> The above command is used to delete a range of lines. . . .Sed Command for search and replace. . .
===> The above command used to do search and replace only for a range of lines. . . .How to delete empty lines using sed command. . .
===> The above two commands produce the same results, It search for empty line and delete it. '^' is nothing but starting of the line and '$' tells the end of the line, so from the starting to ending of the line is empty means delete it. . . .How to remove space from a word. . .
===> It nothing but search and replace, the above command search for empty space and replace it with nothig, so then space becomes nospace. . . .How to remove a lines permanently from a file. . .
===> This above command will delete the line number 2 permanently from the file new_file. . . .How to assign numbers for lines using sed command. . .
===> In the above command '=' symbol is used to assign number for each lines, it works like as same as 'nl' command. . . .How to use Word Boundaries using sed command. . .
===> Normally if u use search and replace it will replace any word which contains raj to kumar, if 'g' is specified. . . .How to include files in sed command. . .
===> The '-f' option is used to include files in command prompt. Ctl-A Moves cursor to beginning of line of text (on the command-line). Ctl-C Break. Terminate a foreground job. Ctl-D Log out from a shell (similar to exit). Ctl-E Moves cursor to end of line of text (on the command-line). Ctl-F Moves cursor forward one character position (on the command-line). Ctl-G BEL. On some old-time teletype terminals, this would actually ring a bell.In an xterm it might beep. Ctl-H Rubout (destructive backspace). Erases characters the cursor backs over while backspacing. Ctl-J Newline (line feed). In a script, may also be expressed in octal notation -- '\012' or in hexadecimal -- '\x0a'. Ctl-L Formfeed (clear the terminal screen). In a terminal, this has the same effect as the clear command. When sent to a printer, a Ctl-L causes an advance to end of the paper sheet. Ctl-N Erases a line of text recalled from history buffer  (on the command-line). Ctl-O Issues a newline (on the command-line). Ctl-P Recalls last command from history buffer (on the command-line). Ctl-Q Resume (XON). This resumes stdin in a terminal. Ctl-R Backwards search for text in history buffer (on the command-line). Ctl-T Reverses the position of the character the cursor is on with the previous character (on the command-line). Ctl-U Erase a line of input, from the cursor backward to beginning of line. In some settings, Ctl-U erases the entire line of input, regardless of cursor position. Ctl-X In certain word processing programs, Cuts highlighted text and copies to clipboard. Ctl-Y Pastes back text previously erased (with Ctl-U or Ctl-W). Ctl-Z Pauses a foreground job. . . .List of Users to be Added . . .
. . .Script to automate User and their Password Adding . . .
echo "User Name is :$i"
echo "$p" | passwd --stdin "$i"
echo "User $i ’s password changed!" . . .Give permisson and run the script. . .
Changing password for user ravi. User ravi ’s password changed! Changing password for user deepak. User deepak ’s password changed! . . .The File check used to check the password. . . .
. . .Uses of some Build in Variables. . .
9. echo $PATH -----> A colon-separated list of directories in which the shell looks for commands. 10.echo $BASH The full pathname used to execute the current instance of Bash. 12 $? ------> Expands to the exit status of the most recently executed foreground pipeline. 13. $$ -----> Shows to the process ID of the shell and if it used inside a script it shows the process ID of the script. 14. $! -----> Expands to the process ID of the most recently executed background command(&). 15. $0 -----> Expands to the name of the shell or shell script. How to set a value for a variable in single command? How to assign o/p value of a command to a variable? echo "I am User $USER and I am running this script"
echo "The UserID of $USER is $UID"
echo "The name of the Script is $0"
echo "The processID of the script $0 is: $$"
echo "The Script is running from $PWD directory"
echo "Size of User $LOGNAME Home directory($HOME) is :$a"
echo "Status of Previously executed command is: $?" echo "The script $0 contains $LINENO Lines"
When we install Linux we basically do more number of partitions. When allocating disk space for the partitions, the first sector(One Sector = 512 Bytes), or data unit, for each partition is always reserved for programmable code used in booting. The very first sector of hard disk is reserved for booting purpose and is called Master Boot Record(MBR). Step:3 MBR (Master Boot Record), after opening MBR the boot loader code in MBR is executed. Then the MBR needs to know which partitions on the disk have boot loader code specific to their operating systems in their boot sectors and then attempts to boot one of them. Step:4 Select's the particular boot partition(basically /boot), then it need to select the boot loader. Their are two types of boot loader in linux LILO(LInox LOader, / etc/lilo.conf) and GRUB (Grand Unified Boot Loader).LILO is not in use now a days. Step:5 Then the data in /boot/grub/grub.conf is readed, which list all the available operating system and their booting parameters. Step:6 When Linux begins to boot with its kernel, it first runs the /sbin/init program, which does some system checks. Step:7 Then the /etc/inittab file is opened this will tell us which runlevel should be used. Step:8 Based on the Selected runlevel the init process then executes start up scripts located in subdirectory of /etc/rc.d/*. If the runlevel 5 is chosen means then the scripts in /etc/rc.d/rc5.d is executed. Step:9 cd /etc/rc.d/rc5.d . The files inside in the directory are Start up with two things "S" and"K". The scripts starting with "S" are executed when System starts and the Scripts starting with "K" are executed when the system shutdowns. The Number that follows the K and S specifies the position in which the scripts should be run in ascending order. Step:10 Then the scrips inside the /etc/rc.d/rc.local are executed, if u manually added any.